Retail $219.00 SAVE 37% ! 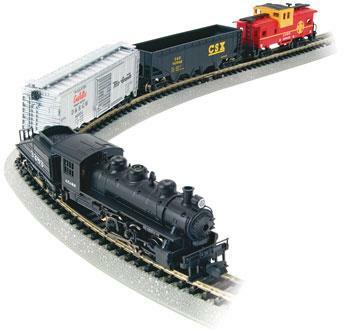 "A great way to start"
Bachmann produces inexpensive model railroad products that are nicely detailed. This is a great starter set, giving you the basics for a layout. Though it is labeled for 14 years and up, my 7 year old grandsons have been playing with N scale trains for 2 years. The main problem younger children have is connecting and disconnecting the E-Z track without damaging the rail joiners. I secured the E-Z track on a piece of plywood and let the kids go. They can do everything else themselves. If you are planning to keep the rolling stock in the original packaging, be sure to use pieces of plastic from refrigerator storage bags behind the cars to make them easier to remove without damaging them. A 24" circle track layout consisting of snap-fit E-Z Track with nickel silver rails on molded gray roadbed. Powerful Atchison Topeka & Santa Fe 0-6-0 steam engine (#3283), and sloped coal tender, with operating headlight. 2 accurately molded freight cars with correct painting and printing: - Box Car (Green Bay & Western) - Open Quad Offset Hopper (Southern) Accurately molded ATSF wide vision caboose. Quality Bachmann Power Pack and analog Speed Controller with electronic circuit protection, plug-in wiring, power indicator light and direction switch.